If you are leasing, buying or selling a residential or commercial property and require a swimming pool inspection Noosa expert to help you obtain pool certification and receive a safety certificate in the most efficient way possible you are in the right place. We can give you the necessary information and guidance to help you get your safety certificate quickly, efficiently and with the minimum of hassle. The pool safety standards were updated in 2010 and from the 1st December 2010, all swimming pools on regulated land in Queensland are required, at the time of sale or lease of their property, to have a pool safety inspection conducted by a licensed pool safety inspector and be issued with a pool safety certificate stating that the pool complies with the new pool safety laws and standards. As licensed pool safety inspectors, TPSI provides certified inspections offering variety of services. This includes pre-purchase pool certification inspections as well as pool safety certificates and consultations to assist you in achieving your pool fence certification. Our trouble-free pool safety inspection service can provide you with practical, quality advice if you are not compliant with the current pool safety legislation. We offer fixed pricing that is not only competitive, there are no hidden fees or charges. You will also appreciate the pre-inspection checklist that we provide free of charge. It will help you to identify any common issues that may be a problem. It will also point you in the right direction if you need any work done on the pool fence before you have the safety inspection completed in order to achieve pool fence compliance. The pool area should be more than a fun place to spend some time; it should also be safe. When you think about how many children die in swimming pool drowning accidents, which is a major reason why children under 5 die, it becomes obvious that safety also needs to be an important consideration. Some of the things you can do along with the pool safety inspection are to learn CPR and to provide adult supervision. It is also important for adults to know how to swim. Book your pool safety inspection in Noosa today. Why Choose Us For Your Swimming Pool Inspection Service? 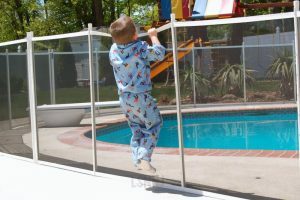 APSIC Certified and Trained – When you use us, you are using a professional service that has all government requirements for pool safety inspections of pool fences. Complete inspection of the pool area and surrounding area (including the safety barrier) – We provide a professional pool safety inspection. It includes a nonconformity report that would outline any issues if your pool fence did not attain pool fence compliance. Inspections for pre-purchase – Knowing that the pool meets the standards and has pool certification helps make you feel better about buying a home with a pool. We provide a complete and detailed swimming pool inspection service. Confirming pool safety – Even if you are not selling or leasing the property, we can still come out and confirm that the barrier and pool meet current safety standards. This is perfect for those who are curious and want to provide the safest swimming experience possible for the family. A pool safety certificate is not typically needed if you are not leasing or selling your home in Noosa. Since November 30, 2015, it was required that you meed the current safety standards for pools. Our consultative inspections of pools provide you with peace of mind. During this inspection, we come to your property and check both the pool safety and the compliance of the pool barrier to ensure they meet current safety standards. After the inspection takes place, we provide a letter to give written confirmation that the pool is compliant or, if needed, to show what is non-compliant and give some options for fixing the situation. This is a good idea if you don’t need a safety certificate but want to ensure that it is safe. If you are buying a property that includes a spa or pool, you can feel better about it by using our pre-purchase pool inspection service in Noosa. The Shire of Noosa is a local government area about 130 kilometres (81 mi) north of Brisbane in the Sunshine Coast district of South East Queensland, Australia. The shire covers an area of 868.7 square kilometres (335.4 sq mi), and existed as a local government entity from 1910 until 2008, when it amalgamated with the Shire of Maroochy and City of Caloundra to form the Sunshine Coast Region. The amalgamation occurred despite the 2007 referendum in Noosa Shire by the Australian Electoral Commission where 95% of voters rejected amalgamation. In March 2013, 81% of residents voted to leave the amalgamated Sunshine Coast Region. On 9 November 2013 an election resulted in Noel Playford being elected to take office as mayor on 1 January 2014 with the new council.